Filmmaker Anders Weberg plans on releasing his great masterpiece Ambiancé in 2020. It'll clock in at 720 hours long (30 days). But to whet everyone's appetite, he released a trailer in 2014 that's a mere 7 hours and 20 minutes long. Or you could watch the speeded-up version, only 1 minute long. 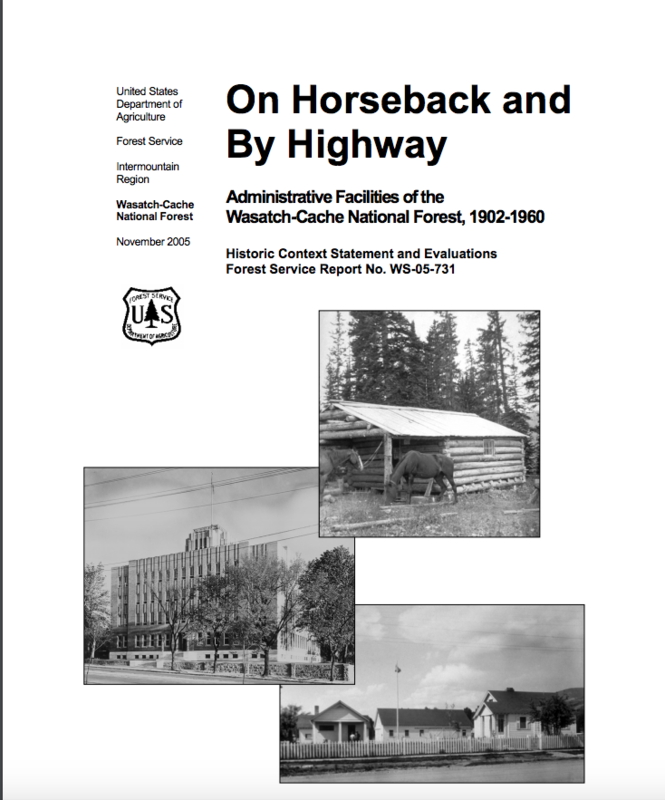 On Horseback and By Highway: Administrative Facilities of the Wasatch-Cache National Forest, 1902-1960. It's been way too long since we set the Gold Standard of Boredom with the TIMBER BRIDGE INSPECTION video. 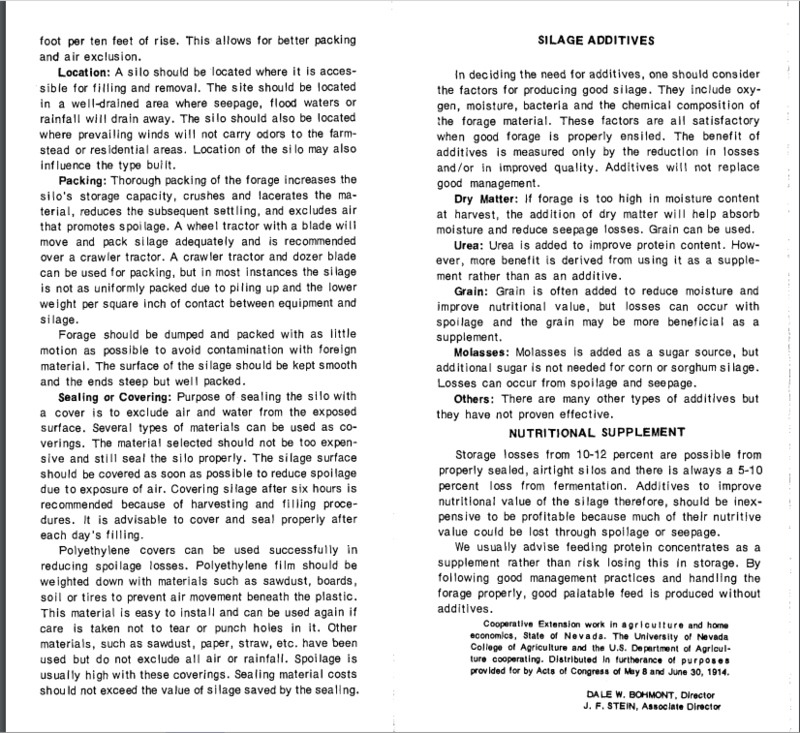 But maybe we can match it with this pamphlet. Feel free to read all 214 pages at the link. 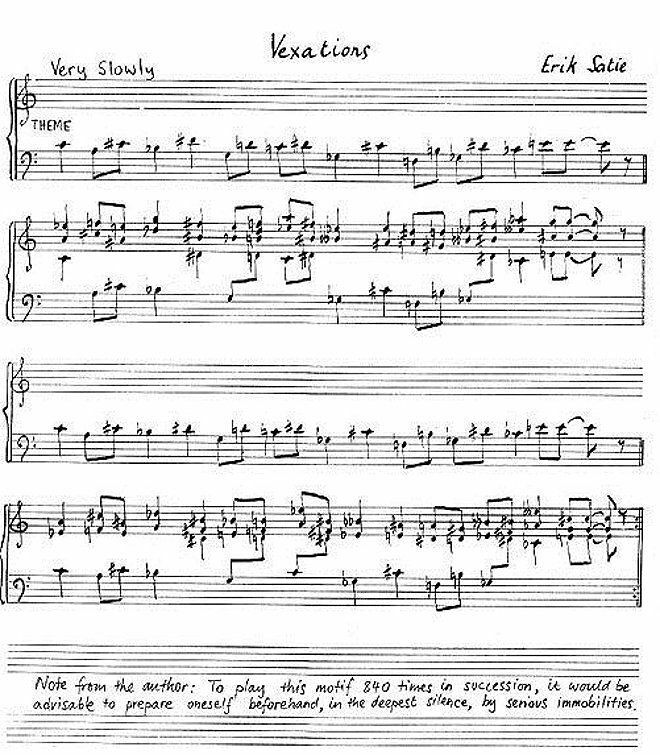 Eccentric composer Erik Satie wrote "Vexations," a four-line piece of music, around 1893, though that date is a guess because it remained undiscovered until his death in 1925. It was an unexceptional piece of music (by design), except for the instructions he attached that seemed to indicate that it should be played "840 times in succession" by a pianist who should "prepare oneself beforehand, in the deepest silence, by serious immobilities." It's not clear why he chose the number 840. 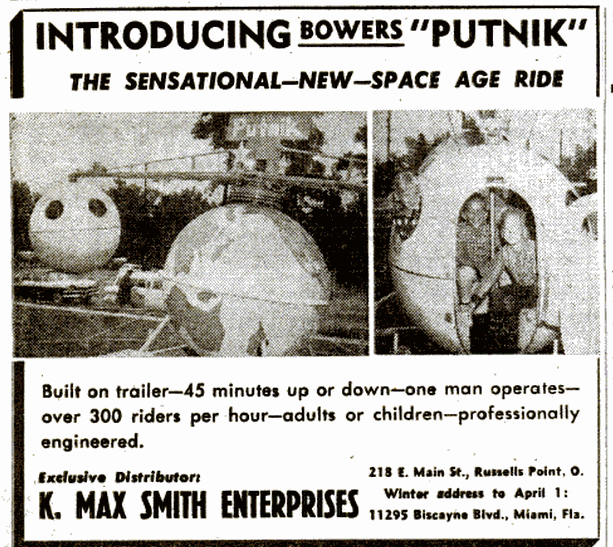 It was first performed in September 1963 at the Pocket Theater in Manhattan. 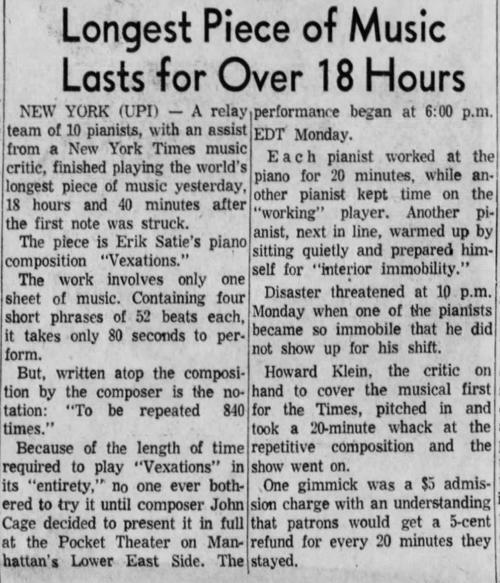 Composer John Cage arranged for a relay team of 10 pianists to play the entire thing, 840 times. The entire performance lasted 18 hours and 40 minutes. There was a $5 admission fee for audience members, but you got 5 cents back for every 20 minutes you listened to it. Joel Meltz sat through the whole thing, so ended up getting a refund of $2.80. It's subsequently been performed a number of times and is, of course, available on YouTube. Check out the video below of the guy who plays the entire thing, alone, in under 10 hours. A native-born American, of average age, average size, average education and average viewpoint. He had to own an average home on an average street, drive an average automobile and be head of a family of four, which is the average used by the census bureau. He had to be engaged in an average one-man business, be neither a leader nor a laggard in public affairs, neither prominent nor obscure, popular or unpopular. To conduct his search, Dutton used the census report, a map, and a weather chart to select America's most average city, which he decided was Fort Madison, Iowa. Then he conducted a survey of Fort Madison's residents to determine who the most average man living there was. He finally settled on Roy L. Gray, owner of a clothing store. 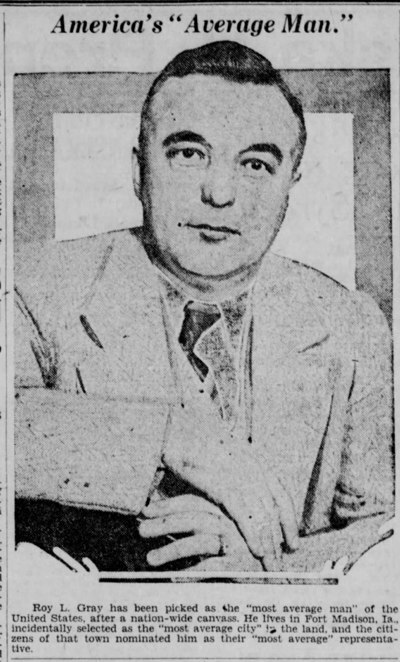 Gray was 43 years old, married, and had two children. Dutton knocked on Gray's door and informed him that he was the most average man in America. Gray seemed to take the news in stride. He agreed to an interview, and then was whisked off to Chicago where he was given the VIP treatment, which included getting to meet the mayor. Then he returned to his average life, and as far as I can tell never made the news again. He should have tried to hook up with Miss Typical. "If a ripe head is squeezed, an enormous number of little things fastened together in a sticky mess are jerked out." They teach this filth in our schools!?! You know, I was actually getting into this a little bit, finding the esoteric knowledge somewhat alluring. But five parts adding up to over two hours? I'm gonna call the total program a fit candidate for our "Boring Video" competition.